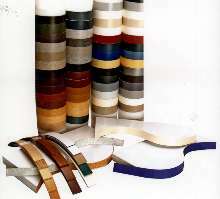 PVC Tapes offer smooth and textured surfaces. Available in .018 in., 1 mm, 2 mm, and 3 mm thicknesses, Contours PVC Tapes are stocked in smooth and textured finishes in colors and woodgrains. Products are designed to identically correspond with major brands of laminate and are also available in custom colors and sizes. OUTWATER PLASTICS INDUSTRIES, INC., Wood-Ridge, NJ - OUTWATER now has you completely covered from surface to edge with the introduction of its new line of CONTOURS PVC TAPES to complement its huge array of trims and surfacing already offered. Stocked in smooth and textured finishes in all of the most popular commodity colors and woodgrains in .018", 1mm, 2mm and 3mm thicknesses to identically correspond with all major brands of laminate, Contours PVC Tapes is also available in custom colors and sizes. OUTWATER INDUSTRIES, with facilities in New Jersey, Arizona and Canada, has served its customers since 1972 as "the source" for in stock, ready-to-ship standard and innovative component products.